Mobile Restaurant Website: Why You Need One And How To Build It. Why Does Your Mobile Restaurant Website Matter? 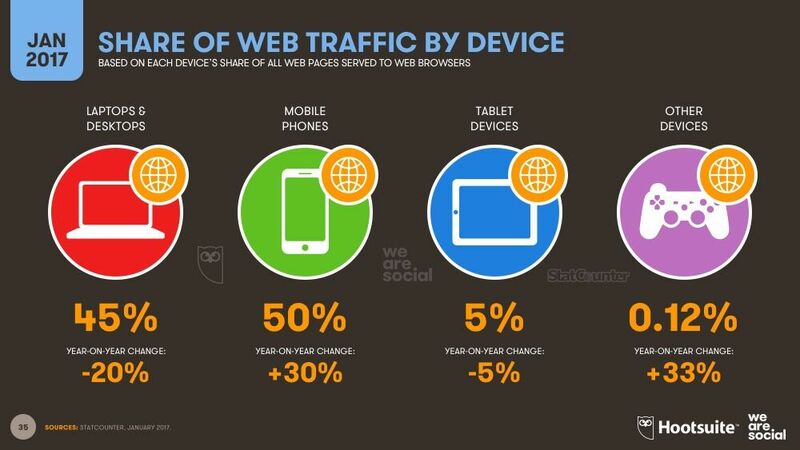 Mobile website traffic is skyrocketing across the world. In 2017, odds are that more than half of your restaurant’s website visitors are doing so from a mobile device. The Digital in 2017 Global Overview report from We Are Social and Hootsuite found that more than half of the world’s population now uses the internet, and that number will continue to grow. Of those connected individuals, 50% access the internet from a mobile device - another figure that will keep rising. It’s already up 30% from 2016. On the flip side, the share of desktop internet traffic decreased 20% from 2016. And that’s not because desktop internet usage is dwindling, it’s just a consequence of the rise of ever-advanced handheld devices. Blanket statements about what’s happening across the world are good to know, but drilling down to your country’s mobile usage paints the clearest picture. 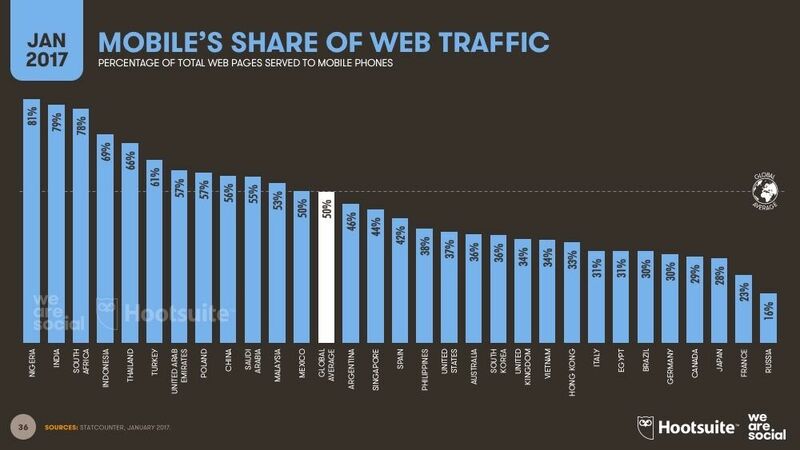 Take a look at the share of mobile web traffic in specific countries for 2017 below. Search Engines Really Care About Your Mobile Website Experience. If your restaurant website is not friendly to mobile visitors, search engines are going to penalize it. Your website will not appear early in search results if it provides a bad experience to mobile visitors. Simply put: less visibility in search means fewer people finding your website, and fewer people through the front door of your restaurant. The good news? You can find out pretty quickly whether or not your restaurant website is friendly for mobile visitors. Just run it through Google’s Mobile-Friendly Test page - and voila! Potential Customers Really Care About Your Mobile Website Experience, Too. Google’s study on local search behavior highlighted the importance of presenting a mobile-friendly website specifically for people looking to find local restaurants and businesses. The study found that 50% of individuals who used their mobile phones to perform a local search for a physical business actually visited a location within a day. Meanwhile, only 34% of those who did the same thing from a desktop device ended up visiting. Your mobile website is not just a necessity for functional business reasons - it’s a reflection of your brand. Increasingly, it is a measure of social proof. 57% of users say they won’t recommend a business with a poorly designed mobile site. Save The Apps For Your Menu, Not Your Mobile Presence. With a properly designed mobile restaurant website, people don’t need to go through the additional hurdles of downloading an app - which might not even be compatible with their device - to get the information they’re seeking. This also means there’s no extra time or financial investment on your end to build and manage an app. Customizing your mobile restaurant website allows you to provide a tailored, seamless experience across all devices - even ones that don’t exist yet - for your visitors. The Checklist: Everything Your Mobile Restaurant Website Needs. Regardless of whether or not pam cooking spray gets used in your restaurant’s kitchen, this simple acronym is the essential ingredient for your mobile restaurant website. These are the 3 things any visitor is going to want at least 1 piece of: your menu, phone number, or address. Menu: Make it front and center! Even if it’s just a button that brings you to a dedicated menu page, or a section lower down on your website. Whatever you do, don’t post a link to PDF menu. Not only is a PDF menu an annoying experience, one that isn’t mobile friendly, but did you know that some mobile phones can’t even open PDFs? Text menus are the best option for your mobile website. With this in mind, make sure your website builder offers the flexibility to customize your restaurant menu for mobile visitors. Address: Of course, visitors need to be able to find your restaurant. But when it comes to your mobile website, you want to delight them. Make the address a clickable link that will open right in a maps app! Or even better, you can include a dynamic map right on your website. Phone Number: Not everyone wants to make their restaurant reservations online, and there are a multitude of other reasons why someone would pick up their phone and give your restaurant a ring. Put your number at the top of your mobile restaurant website, and make sure that visitors can simply click it to place a call. With the rise of mobile internet usage comes the rise in customer expectations for what they should be able to accomplish from their mobile phones. 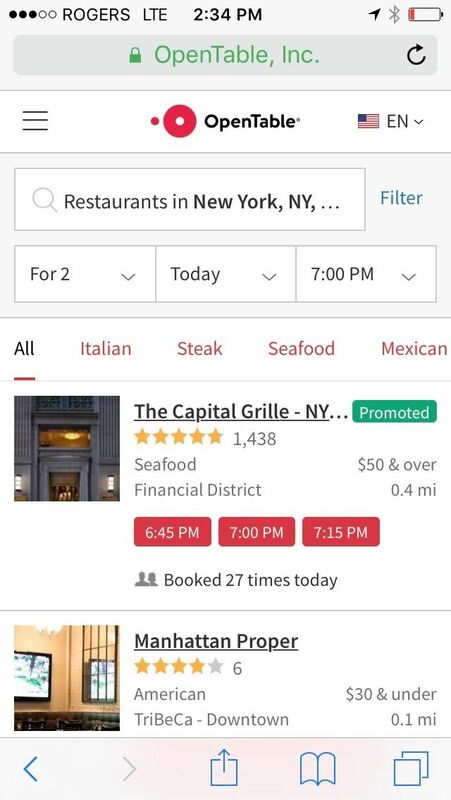 To this, your restaurant needs to accept reservations on its mobile website. What might have seemed like a serious challenge just a couple years ago is now possible in many different formats through services designed to suit your restaurant. Remember, choosing the right reservation or booking system for your restaurant must be done with mobile at the top of your mind. When you choose the right website builder, updating your mobile restaurant website should be easy and fast. Carve out a section where you can highlight current specials, cocktails, or promotions - and then swap them out whenever they’re done with ease. Whether it’s beautiful shots of your restaurant’s interior or close ups of your signature dish, don’t leave a potential visitor wondering. Help them to visualize their experience and get their mouths watering before they’ve even walked through your door. If you don’t have any online reviews you can link to, there are some simple tactics you can use to get customer testimonials in person. You can have the best looking restaurant website around, but it won’t be able to send a single new customer your way if you don’t optimize for search engines. SEO is a deep topic, but you can start diving in with some simple hacks that will make a valuable impact. Mobile usage will continue it’s growth to dominate the lion’s share of internet access into 2018 and beyond. At the end of the day, your mobile restaurant website design is just as important as it’s desktop counterpart - if not more. You need to make sure that you choose a website builder that can allow you to serve up a website that can be customized for both desktop and mobile. Find out how PageCloud can help you to create the restaurant website you've been craving today.